Photochrome showing how it looked in about 1905 - Photo from Camera Images GBPictures collection. 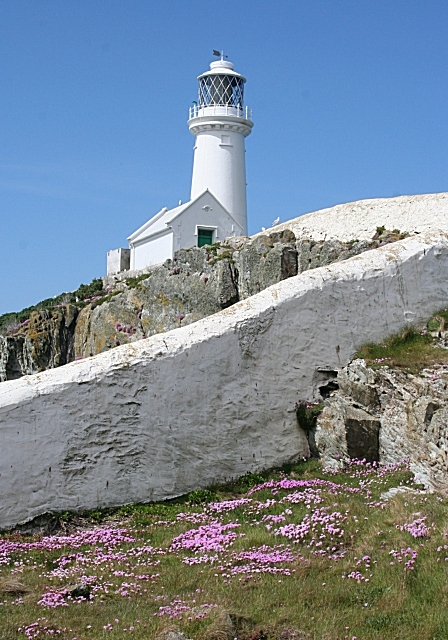 On an island off Anglesey, this lighthouse was constructed in 1809. It is now open to members of the public for an admission fee but access is down a steep stone stairway with over 400 steps and then over a bridge. Ynys Lawd is a rocky island separated from the cliffs of Ynys Gybi (Holy island) by a rocky channel. 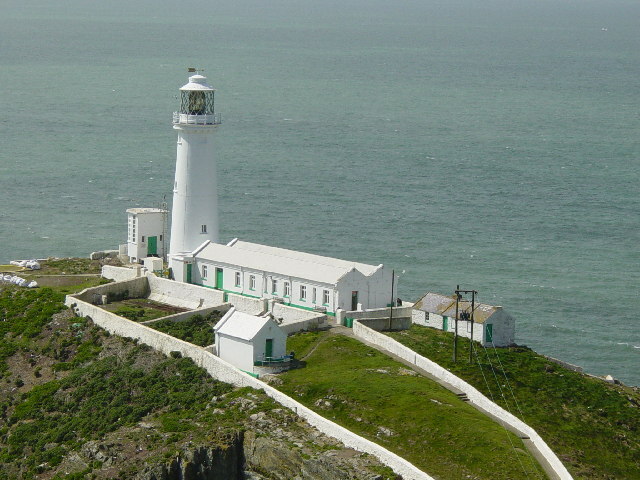 It is the most westerly point of Ynys Môn (Anglesey) and must have been a major danger to shipping before the construction of the lighthouse in the early 19th century. and although no longer manned, is still in use. 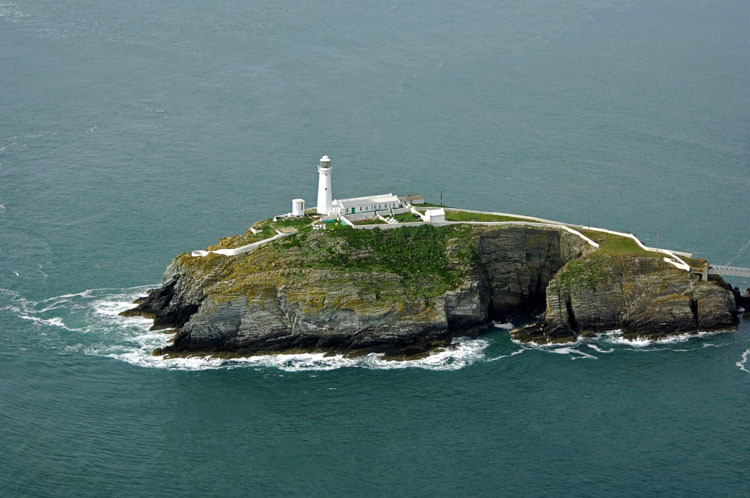 Situated off the island of Anglesey, near the north west tip of Wales, the tiny islet known as South Stack Rock lies separated from Holyhead Island by 30 metres of turbulent sea, surging to and fro in continuous motion. The coastline from the breakwater and around the south western shore is made of large granite cliffs rising sheer from the sea to 60 metres. South Stack Lighthouse was first envisaged in 1665 when a petition for a patent to erect the lighthouse was presented to Charles II. The patent was not granted. The first light appeared to mark the rock on the 9th February 1809 . The lighthouse, erected at a cost of £12,000, was designed by Daniel Alexander and originally fitted with Argand oil lamps and reflectors. Around 1840 a railway was installed by means of which a lantern with a subsidiary light could be lowered down the cliff to sea level, when fog obscured the main light. In the mid 1870's the lantern and lighting apparatus was replaced by a new lantern. No records are available of the light source at this time but it was probably a pressurised multi-wick oil lamp. In 1909 an early form of incandescent light was installed and in 1927 this was replaced by a more modern form of incandescent mantle burner. The station was electrified in 1938. 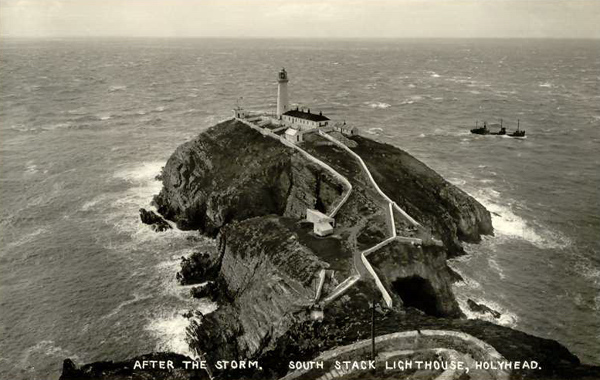 On 12th September 1984, the lighthouse was automated and the keepers withdrawn. 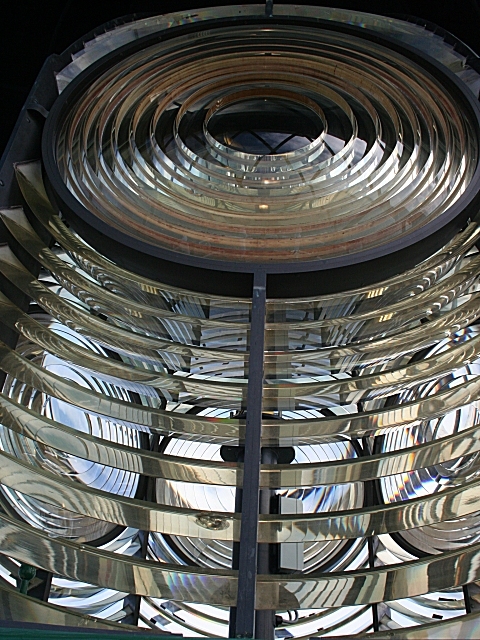 The light and fog signal are now remotely controlled and monitored from the Trinity House Centre in Harwich, Essex. On Tuesday 25th October 1859 it is said that the most severe storm of that century occurred. It became known as the 'Royal Charter' gale, and on that and the following day over 200 vessels were either driven ashore or totally wrecked with the loss of 800 lives. The steamship ROYAL CHARTER was among these, and she sunk within yards of help with the loss of almost 500 passengers and crew. On the same evening Assistant Keeper Jack Jones had been making his way across the iron bridge on to South Stack so that he could join the Principal Keeper Henry Bowen, already on duty. A rock was swept from the cliff by the strong wind, fell and struck him on the head. Covered in blood, almost senseless with concussion, he dragged himself up the gale lashed path. Feebly he cried out for help, then, head in hands, he lay unable to move any further. Henry Bowen found him in the same place on the Wednesday morning, groaning and unable to move, his hair matted with blood. Jack Jones died three weeks later of a compound fracture of the skull. The chasm between the mainland and the rock was at first traversed by a hempen cable 21 metres above sea level, along which a sliding basket was drawn carrying a passenger or stores. This system was replaced in 1828 by an iron suspension bridge 1.5 metres wide and again in 1964 by an aluminium bridge. The present footbridge was completed in mid 1997. Grants totalling £182,000 were received from the Welsh Development Agency to fund the structure which was designed and built by Laings/Mott Macdonald. The landward approach to the bridge is by descending 400 steps cut into the cliff face. Visitors may tour the former lighthouse engine room and exhibition area before climbing to the top of the lighthouse. South Stack is a wonderful place to watch thousands of breeding seabirds including guillemots, razorbills and puffins. Visitors cross the footbridge, after descending 400 steps from the parking area, and they must climb those steps on their return. Despite the strenuous climb, this is a well visited lighthouse, one of the best known in Britain. The tower is open to guided tours (limited to 12 persons per tour, tickets required). 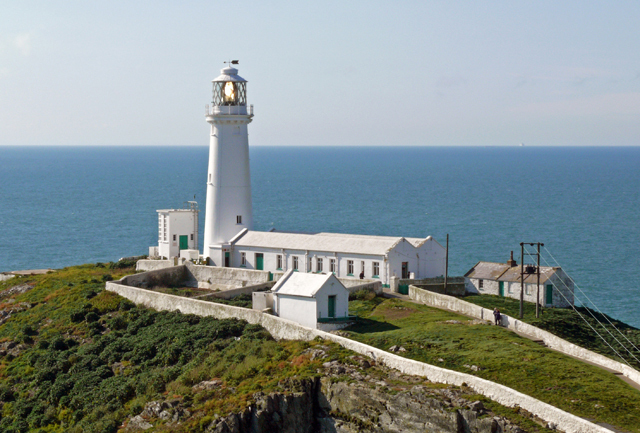 Tickets can be obtained from the lighthouse but you can also get them from South Stack Kitchen, where the car is parked, before all those steps. Also there is a photo in Significant Islands in the British Isles. Round stone tower with lantern and gallery, attached to 1 storey keeper's quarters and service building. Entire structure painted white. 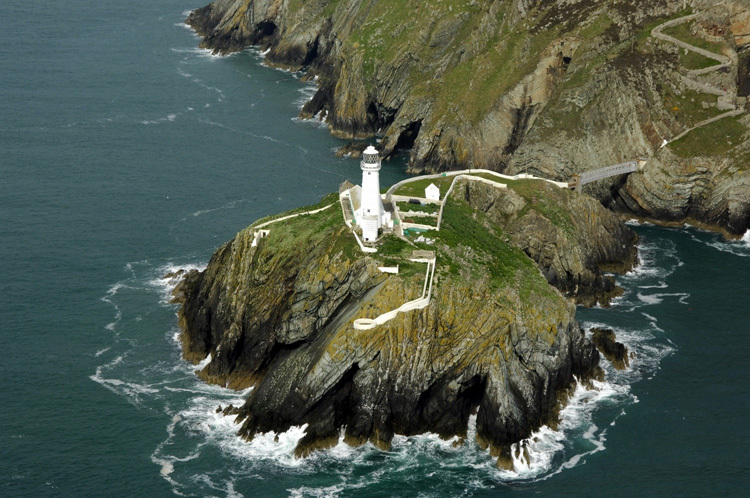 Located about 5km (3 mi) west of Holyhead. 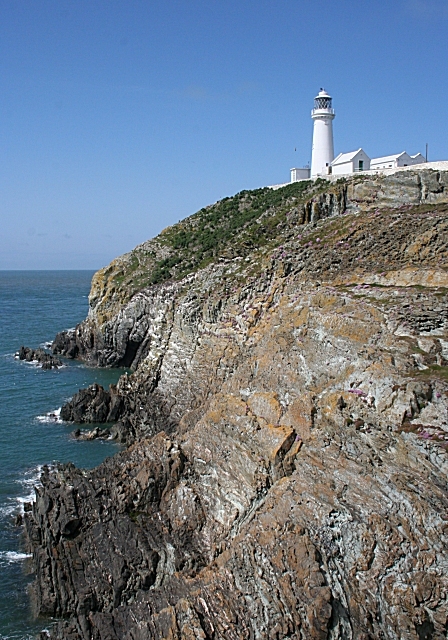 South Stack is a steep sided island off the western tip of Anglesey. Getting there: It is signposted from both Holyhead and Trearddur Bay. Car parking available in the RSPB car park at the South Stack Kitchen Cafe. A PDF can be downloaded relevant to the 2010 year. 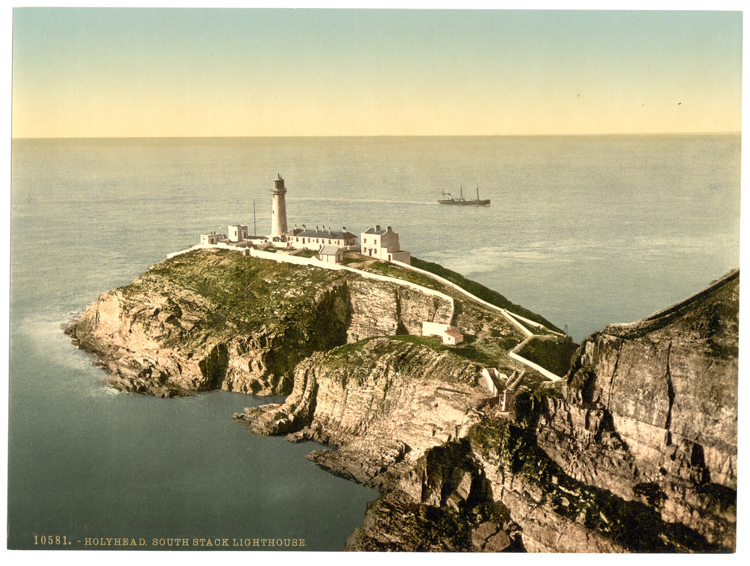 Tickets may be purchased from the Lighthouse or South Stack Kitchen, (before all those steps).